Batman 66 comics have always been pretty fun in the past. They have a nice balance of action and wit to keep you guessing throughout the adventure. That’s why I was surprised when this one actually didn’t turn out to be all that good. It’s still fun for the Batman and Robin scenes, but the artwork took a huge nosedive and the characters that the heroes get to meet aren’t too interesting this time around. Considering that these crossovers are quite limited with how many can be produced at a time, it’s a bit of a shame that we wasted one on these guys. The comic starts off with Catwoman deciding to steal a large diamond. Bruce Wayne and a rich lady happen to be in the area so Catwoman goes after them next. With the lady’s tough talk and banter throughout, I figured that she was Mrs Peel. No, the real Steed and Mrs Peel show up shortly afterwards to try and handle the situation. Robin and Alfred (Dressed as Batman appear as well so the villains are corralled quite nicely. It turns out that this is a bigger plot that is being led by the villains of the Avengers series. That is really Steed and Mrs Peel’s only cling to fame by the way. The series they are from is actually called The Avengers so at least it sounds impressive to the average comic reader. Their main villains seem to be a large organization that uses Cybernauts (Androids) to do their evil bidding. These cybernauts are now going to destroy the world once they get the diamonds so Batman and Robin have to stop them. Here’s why the crossover doesn’t work very well. If you thought that the two men from Uncle weren’t too useful, these chaps are even worse. All they do is bicker and banter throughout their appearances. They don’t really contribute at all except for moments where you figure that Batman and Robin should have had the situation under control anyway. They made for rather boring characters in the story and couldn’t really keep your attention. At the very least, that’s why I couldn’t really get behind these guys. I didn’t really warm up to them by the end either. They had a convenient habit of forgetting everything about the villains until Batman and Robin would find out first. By then it’s not as if it really mattered. One of the good moments of the comic was when the Cybernauts broke into the Batcave. Of course it was the guest stars’ fault again as they didn’t notice that the villains had bugged them. Still, it was pretty intense since I don’t believe a villain had ever gotten inside before in this continuity. Batman and Robin did a good job of holding the fort even against overwhelming odds. The Cybernauts actually have potential as they are henchmen that are actually pretty dangerous in a fight. You can’t say that about most henchmen. Unfortunately, as I mentioned earlier the art is pretty bad. Until now the Batman ’66 comics have all looked really good. This one looks very rough around the edges and the art style is really no good at all. The character designs are all wrong and the fight scenes suffer as a result. The comic now has to thrive purely on the dialogue. The writing is pretty strong as you’d expect so at the very least that does help the comic quite a bit. I think this author actually liked Robin more than the rest because he looks good for a change. He gives Batman a few ideas and even saves the day once or twice. He’s portrayed as being fairly close to an equal in this adventure so his fans will like that. Batman still looks like the capable leader he always is as well. He’s just more open to suggestions this time around. The comic had a decent misdirect with the rich lady from the beginning, but once you knew that she wasn’t Mrs Peel it was pretty clear that she had to be one of the villains. Batman was a little too emotionally attached though considering that they barely knew her. He didn’t take the twist very well although I suppose he put up a decent front. Most of the characters didn’t suspect a thing. Mrs Peel finding out his secret identity was a little iffy, but I suppose that usually happens in crossovers for the mutual hype for both franchises. 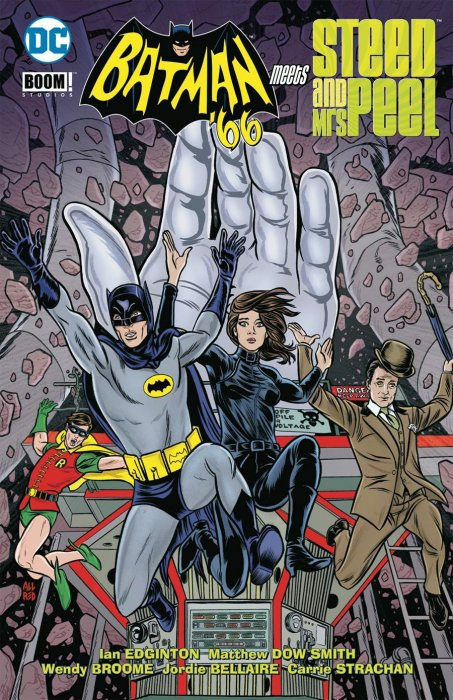 Overall, This may not have been the best Batman ’66 comic, but the series does set a high bar. It’s still as reasonably entertaining comic and I’d recommend it if you’ve already read the rest of the issues. It had some decent fights and Batman’s always a fun main character. Beyond that, I’d still never recommend this over any of the other volumes to be honest. The crossover just didn’t work and at the end of the day that takes away a considerable amount of the hype behind the volume. I’m still ready for more Batman 66 crossovers though and the only one left is where they meet Wonder Woman. That should certainly be a great team up so it’ll be fun to read it some day. This entry was posted in Comic Reviews, Comics, Reviews and tagged Adam West, Batman, Batman 66, Comic Review, Crossover, DC, DC Comics, Mrs Peel, Review, Robin, Steed by dreager1. Bookmark the permalink.